Raising chickens is not what it used to be, as debt-laden farmers have been attempting to tell us for some years now; Carole Morrison, featured in Food Inc., comes to mind, as does Craig Watts, a former contract producer for Purdue, who blew the whistle on industry practices in 2014. 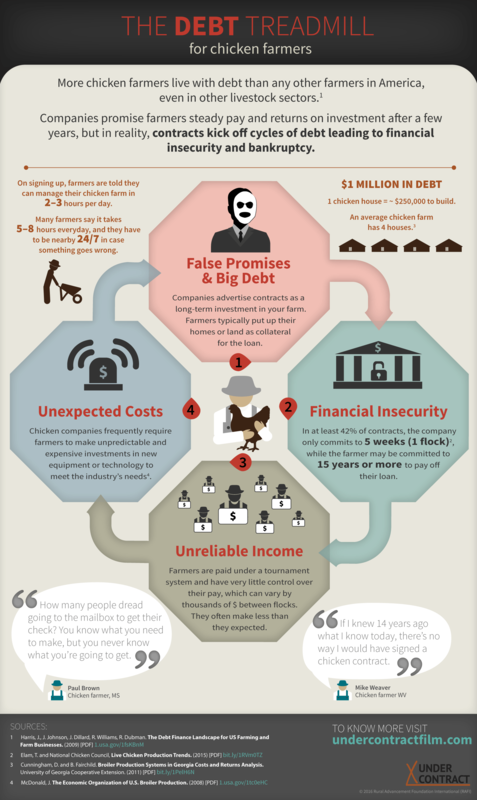 Take a look at the Rural Advancement Foundation International’s (RAFI) new infographic about the plight of contract poultry producers, then wander over to RAFI’s webpage to view Sally Lee’s detailed analysis, What Debt in Chicken Farming Says About American Agriculture. Chicken is America’s favorite meat, generating more than $30 billion a year in revenue. Who benefits from this multi-billion dollar industry? –Not the farmers raising the chickens. Not the workers in the processing plants. And certainly not the chickens. Ninety-seven percent of the chicken produced in the US is raised by family-operated farms that have contracts with large, vertically-integrated companies. While the companies own the chickens, the farmers own the costly production facilities, which places them in an extremely risky financial situation. Companies use complex contract clauses and payment mechanisms to control their own costs and outsource risks to poultry farmers. The companies benefit from a power imbalance: a farmer at risk of losing their family’s land is not likely to speak out. Under Contract tells the stories of farmers who are caught up in the fine print and claims that the way we do agribusiness must change if we are to protect both farmers and our food supply from industry abuses. The voices of farmers are not easily heard above the constant presence of marketing and advertising from corporations and the food service industry. Our goal is not only to hear farmers’ stories, but to amplify their voices and give everyone a chance to stand with farmers in their struggle for a fair food system. Take a peak at the film website here. View the Rural Advancement Foundation International page here. The USDA is responsible for protecting farmers. The Grain Inspectors, Packers, and Stockyards Administration, or GIPSA, has the authority to create rules to limit the potential abusive and opportunistic behaviors of major agribusiness corporations toward independent livestock farmers.In 2010, USDA and GIPSA drafted rules, which were put up for public comment. Thousands of farmers, consumers, and organizations all over the country submitted their comments. But for the past four years, Congress has blocked the USDA’s action by inserting a “rider” in the federal appropriations budget that effectively prevented the USDA from protecting farmers. In 2015, frustrated farmers and consumers came together and told their representatives to remove the “GIPSA rider.” The USDA now has the green light to follow through on their commitment. – Clarifying that the law does NOT require farmers to prove “competitive injury” to the entire industry when they file a complaint or take legal action to prove that they have been personally harmed by an abusive practice by their poultry company. Sign the petition. Stand up for small farmers who need to make a living in the face of increasing corporate consolidation and power in the poultry industry. Feb. 25 Webinar – Plant in a Box: A Solution for USDA-Inspected Poultry Processing?